Western Australia’s oldest public building the historic Roundhouse goal at Fremantle’s Arthur Head took on a whole different look last night when the dress rehearsals for the FREO ROYALE fringe festival show Out Of The Cave went under way. The play takes a raw and honest look at youth culture, the beautiful and brutal, the drugs, alcohol, relationships, and the ever looming threat of sliding down into the dark from where there is no return. I liked the show a lot and the young actors did a splendid job, so I hope the Freo community will head out to the far west of town from Saturday on to see the show. It is well worth it! Check out http://www.freoroyale.com.au for information about all the shows. 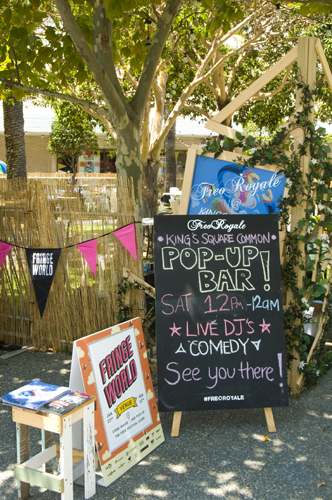 Freo Royale is part of the Perth FRINGE Festival and has set up an alfresco pop-up bar at Kings Square. There will be DJs and Comedy so make it a nice relaxed night out.